When a couple of months ago I read that executive chef Masato Nishihara was leaving the vegetarian Shojin restaurant Kajitsu at the end of March I immediately booked a table. I had wanted to go for a few years, ever since I’d read a dithyrambic comment by David Chang. Kajitsu had languished all this time on a putative restaurant wish list but the occasion never arose, or was never provoked. Suddenly there was some urgency. Then, as these things sometimes will, it happened that on that long awaited Wednesday I was in the hospital with my son, who had just been operated for a nasty case of ruptured appendicitis (doctor’s words). Of course, I could have left Leo in his morphine-induced half-consciousness in the expert hands of the hospital staff, but my mind wasn’t exactly with it. So with great dismay I cancelled the reservation. I must have apologized half a dozen times, over-emphasizing how sorry I was to have to reschedule. Of course, I was sorry less about their booking concerns than my lapsed opportunity. And when, having emerged from hospital limbo nearly a week later, I made a new reservation, I didn’t pay attention to the date. Unsuspecting last week Thomas and I went to Kajitsu. Every dish was surprising. Each element felt very pure, in a restrained way, and I couldn’t help but wonder whether my palate, used to bolder seasonings of garlic, herbs, vinegar, especially with vegetables, might be numb to the subtleties of this deliberate cuisine. Because although the meal was entirely enjoyable — and not least for the many great sakes paired with the food which ranged from mellow and practically sweet to almost peaty — it wasn’t wholly delicious to me. 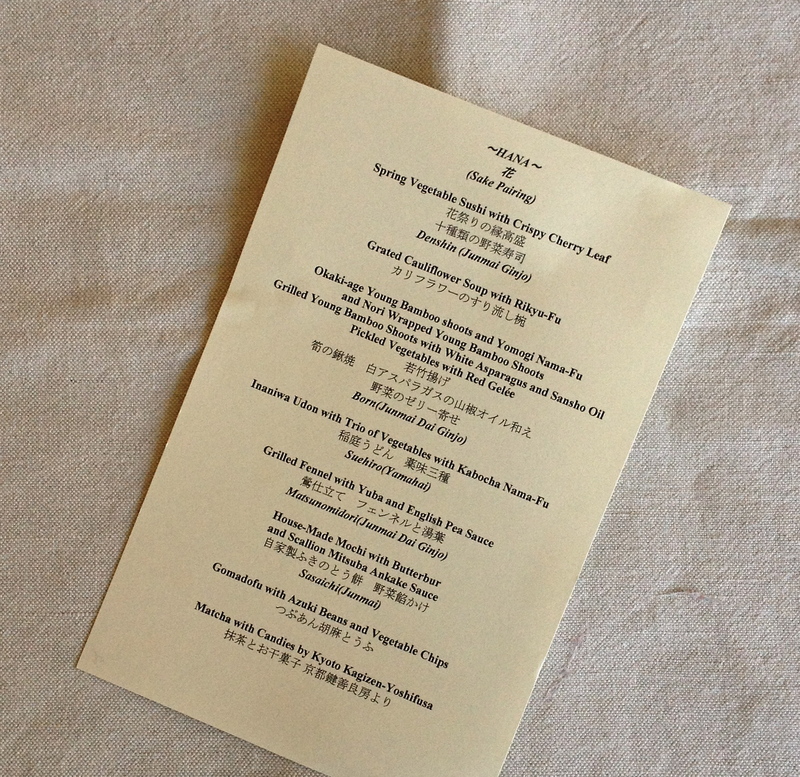 Later as I began writing I realized that we were already in April; we had been feasted by the new chef Ryota Ueshima; Masato Nishihara had moved on. So now I can’t help but wonder whether Nishihara’s cuisine would have struck that spark of deliciousness. I hope I will not miss the next opportunity to find out. Although I’ve not been craving the food and I am not exactly restless to go back, Kajitsu was a revelation. Would I go now had I never been? Definitely. This entry was posted on 19 April 2012 at 14:46 and is filed under Restaurants. You can follow any responses to this entry through the RSS 2.0 feed. You can skip to the end and leave a response. Pinging is currently not allowed. Ha! Yes, I love the word dithyrambic, which is much more common in French. I have wanted to go too, but have never been. Have you ever read Sushi and Beyond? By Michael Booth? He writes about the three month trip he took to Japan just to eat, armed only with Shizuo Tsuji’s Japanese Cooking: A Simple Art (which I just saw had been re-released as some special anniversary edition). In it, he talks about how he had a lot of food in Japan that he thought was nice, but pretty unremarkable. Then he said that he suddenly began just craving, craving, craving those foods (crab in particular, I think it was) and regretting not taking advantage of them more now that the chance was gone. Almost like a ghost, or a memory you wish you remembered. In any case, that’s what the description here made me think of. Sad that Nishihara has gone, but certainly still a place to return to. That’s so interesting, and I can really see that happening. I’ll try to get my hands on Sushi and Beyond. Thanks for the comment.